Webster's New World Webster's New World Essential Vocabulary by David Alan Herzog | Free eBooks Download - EBOOKEE! Posted on 2012-09-20, by sharebookfree. 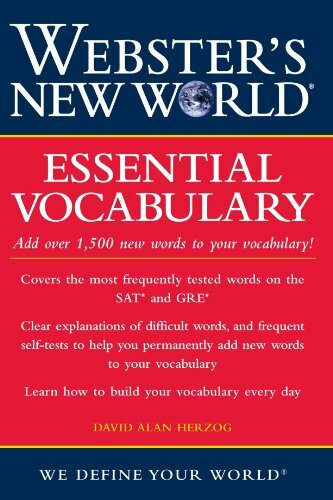 In addition to the most frequently tested terms from the SAT and GRE tests, Webster's New World Essential Vocabulary also includes helpful appendices on foreign phrases, prefixes, and suffixes. Together, these 1,500 words and definitions not only prepare you for tough tests, but also dramatically improve your communication skills for the business world or studying English as a second language. Whether you're worried about college entrance exams or just want to be better with words, this practical, helpful resource gives you the tools you need to read, speak, and write more persuasively, and communicate more effectively. Plus, Handy self-tests let you gauge your understanding of words and meaning, so you can measure your progress as you go! No comments for "Webster's New World Essential Vocabulary".